Guinea Fowl are very capable when it comes to flying and given the choice, will usually prefer to roost in trees, rather than in the housing you provide. Just like other poultry, guineas like routine and if you can provide them with suitable accommodation and get them used to it (from an early age as keets, older guineas will wander off trying to find their way back home) they should return regularly to their house. Guinea fowl keets getting used to their new run. When introducing your keets to their new home, it is important to keep them in for 6 weeks – this seems like a long time I know but it is the best way to ensure they will always come back to roost at night. Since they like to perch high, I found a tall house with high perches inside (a lower perch is useful as a ‘stop off’ for them to use on the way up to this perch) tends to work the best. My guineas are kept behind a relatively low chest high stock fence so to keep them from roaming, I clip a wing on one side. I find this also helps to stop them from roosting in other high places at night, one particular male would fly onto the roof of our garage or house and call out at dusk before roosting up there for the night from time to time. Clipping his wing, stopped this and he roosted again in the ‘Guinea House’. Some people will fence and house their guineas in a small area but provide a landing board around the top of the perimeter fence. This allows the guineas to fly up onto the top of the fence (onto the board) and down again. They should come back at night to roost and can be safely locked away at night but they are at risk of local predators when they are out during the day. 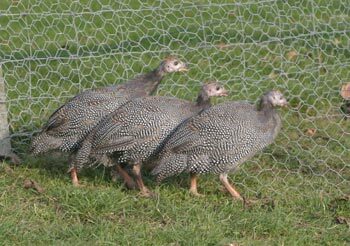 Guinea fowl are alert though and capable of escaping some predators so if you are not in an area with too many predators (foxes), you may consider keeping their feathers intact so they can fly. This allows them to roam during the day, coming back at night to their housing. Hopefully this gives you some ideas for housing Guinea fowl!